Renowned author Rachel Vincent weaves an intoxicating blend of carnival magic and startling humanity in this intricately woven and powerful tale." 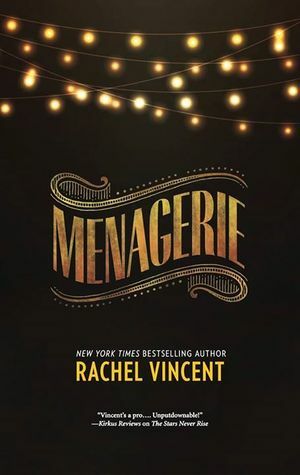 I love Rachel Vincent and cannot wait to read this one! Menagerie will be released on September 29, 2015. I posted this one last week. Yep, definitely waiting with you on the release of Menagerie. I want to read this one! I am wary though as I didn't LOVE her latest release. OOoh nice! Just finished this on Monday from Netgalley! Really liked it too! Very different, but amazing! In case you wanted to request it from Netgalley, it's under the general fiction category! It was no wonder I never found it in Sci-Fi/Fantasy! Or you can always search by title/author! Hope you enjoy it too once you read it! This sounds really good! I hope you enjoy reading it. This one sounds so good! I adore the cover so much. Have an awesome week. YES! I can't wait for this one, too! Great pick! Sounds good, hope that you get a chance to read it soon. YES!!! I'm sooo excited for this one as well! Can't wait for it! YAY! I'm super excited for this one too girl! I love Rachel's books! I'm very intrigued by this one. And I do like this author. Great pick.